This treatment helped me push beyond the boundaries that I have had with my pain. I would get to my level of pain and stop and with the VR exercises I could go beyond my former pain area. Additionally, I have more energy and able to do more, not a great deal but more. I have been able to cut my oral pain meds in half. Overall I found it to be a very beneficial experience and I am very thankful. – J.R.
VR gets me motivated to move because I sit down most of the day. This is more motivational than anything else I tried or have done like going to the gym to exercise. Everytime I leave these sessions I end up walking around for awhile with less pain which normally I would just go to my car but I feel good enough to walk around” – J.R.
Karuna Labs works with providers to demonstrate outcomes in a distributed research platform. 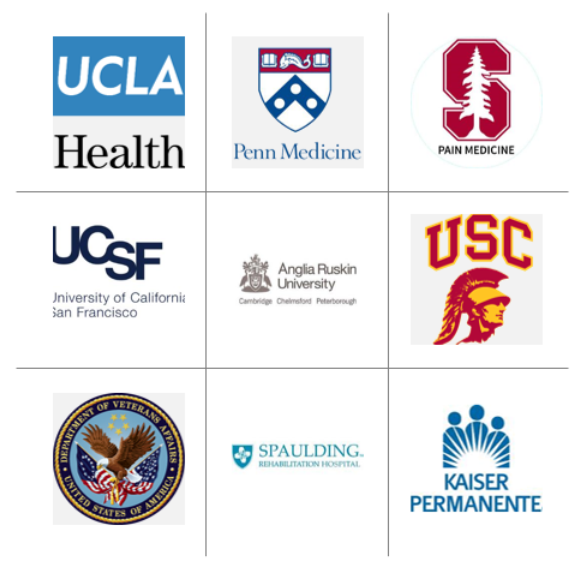 We work with clinicians from UCLA, Stanford, UCSF, and other established academic institutions to deliver the most effective application for chronic pain. Karuna Labs Inc. partners with a number of world renowed experts in physical medicine and rehabilitaion, cognitive neuroscience, pain psychology, physical therapy, and virtual reality technology. Function Restoration Programs, Private pay pain clinics, Biofeedback clinics, and Physical Therapy Offices.